We had a first coaching call with a client this morning. He is a sharp businessperson and a sales leader in the industry. Since I have been in that industry for 30 years we were able to connect pretty fast. He said his biggest challenge was feeling that he was not doing a great job for his company. Let’s get to the real point quickly, I thought, and asked what his volume was. WOW. I’ve been in the top 20% or so in personal sales in the promotional products business for over 2 decades and his number was DOUBLE mine. Knowing the profit margins, the volume he is generating should have allowed the company to hire a dedicated assistant for this salesperson and let him do his thing – create TONS and TONS of business. It turns out that since his business had dropped a bit last year from the previous and went below an arbitrary number that the company set for a solo assistant, he would now have to share. Bad move. Especially when that salesperson starts talking to a marketing oracle and that marketing oracle fans the embers which have been lit in his head. Yes – that company has competitors and those competitors know EXACTLY how to treat a salesperson of this caliber. How does this happen? I think that it is a matter of complacency. This company has 300+ sales people and is viewing them all equally. The rules have to apply equally or the bottom 90% of the group will be pissed. 1. All sales people are not equal. Remember that. 2. Set up rules for how sales people will be treated and follow them. Include in those rules an understanding that sales people are very different from hourly employees. Incentives drive them. 3. Be transparent in showing how the rules are being put in to play. 4. If you say that when a salesperson hits the certain dollar level, let’s say the $1MM mark for example, certain benefits will be added. Add the “one bad year” clause so that they salesperson feels that they have a safety net and that the company understands that sales can be tricky some years and if they stumble, the company has their back. That would help the sales rep who had a year of $850,000 and suddenly got stressed. This is especially helpful if you are in an industry, using this dollar amount example again, where the average was only $150,000. Why lose an $850,000 rep who is worth 5 average reps, just because they had a weird year? 5. Ask for input. If you are a sales driven company, and which companies aren’t, let your salespeople kick in their ideas on where the company is going. A company we work with, SendOutCards, has what they call the Eagles Nest, a group of top producers that changes each 6 months. The ownership has them on weekly calls to ask for advice and it has boosted sales tremendously. 6. “Appreciation wins out over self-promotion every time.” Make sure you TELL your salespeople, especially the top ones, you appreciate what they are doing and if they have issues, address them right away. When you have meetings, have the top sales people on stage, sharing their success stories. If you have a sales person who is not in the top level but still had a really great sale, put THEM on stage to talk about that sale. It shows everyone what happens when they get to the top level. 8. Remember that everyone in the company can be in sales. 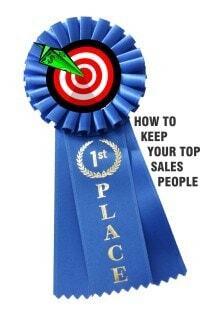 Come up with a couple of programs which let the non-salespeople be part of the fun. 9. Survey your clients. When they say something great about their salesperson, let EVERYONE know. If it is negative, ask the salesperson if the two of you need to come up with a plan to get that client back on your company’s good side. 10. Don’t be afraid to say “yes” but have the courage to say “no.” OK – some salespeople can be prima donnas… Be honest, show appreciation, and have them come up with a way that the NO can be turned in to a YES. OK, there are a few tips. Hope they help your company.